Swakeleys, called after the Swalclyve family which owned the land in the 14th century, is not the first important residence on the Estate. Records going back to the middle ages mention a substantial manor house surrounded by a moat. Nothing is known of its appearance, though there are many old timbers in the roof of the present buildings which were probably recycled in the 1630s from the earlier buildings. In 1629 the Estate was purchased by Edmund Wright, a wealthy London merchant then reaching the peak of his prosperity. Sir Edmund Wright is chiefly remembered for commissioning the magnificent buildings at Swakeleys Estate, which were completed in 1638. It was intended as a retreat within easy reach of the City of London, where he would have had another home, no doubt also a home with which to impress his visitors with his power, good and fashionable taste and immense wealth. A member of the Goldsmith’s Company, Wright was an important financier, wealthy enough to afford a second home away from the noise and filth of seventeenth century London. As his business and Royal contacts were in the City, he would have spent most of his time there; Swakeleys would probably have been occupied more by his wife and children and used for grand, power, entertaining. Wright reached the peak of his success in 1640, when he served as Lord Mayor of London, making him one of the most powerful businessmen in the country, as well as one of the richest. Swakeleys was built to impress. It was built in an exuberant style of architecture later dubbed ‘Artisan Mannerism’ by the historian Sir John Summerson (1904-1992). The style was developed by London craftsmen for patrons who were keen to update the prevailing Jacobean style with classical elements taken eclectically from Italian and Northern European architecture. This is shown on the exterior, where traditional Tudor-style windows are combined with up-to-date Dutch gables. This particular kind of ‘Dutch gable’ is, in fact, peculiar to English architecture and has been called the ‘Holborn gable’, after the London district where they first appeared. Swakeleys is built of brick, a prestigious material in the 1630s. 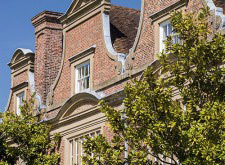 The ornamental details are applied in render, including the scrolls at the base of the gables and the triangular pediments above. What really strikes the eye, however, is the extraordinary outline of the building, caused by the Dutch gables’ continuing around the projecting wings. Like the great Elizabethan and Jacobean mansions before, with its H-shape, the building has a constantly shifting silhouette as one walks around it, with four beautiful and important elevations.